USA Songwriting Competition winner Christopher Tin wins 2 Grammy Awards at last night's 53rd Annual Grammy Awards. This marks a historic win, making Christopher the only USA Songwriting Competition winner to win 2 Grammy Awards in the same year. Christopher Tin won an honorable mention award at the 15th Annual USA Songwriting Competition with the same song that won two Grammy awards. Christopher Tin is an American, Grammy-winning composer whose work is primarily classical, with a world music influence. He won two Grammy Awards for his classical crossover album, Calling All Dawns. He is also a composer for films, video games and commercials. Tin is best known for his composition Baba Yetu, featured in the 2005 computer game, Civilization IV. Christopher Tin made video game history today, becoming the first composer to win a Grammy Award for a song composed for a game. 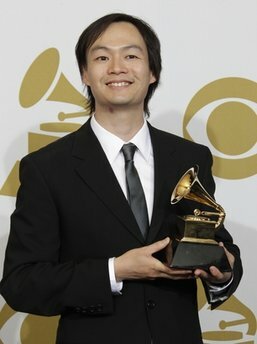 Tin took out the Best Instrumental Arrangement Accompanying Vocalist(s) at the 53rd Grammy Awards in Los Angeles yesterday for his composition "Baba Yetu", the opening track from Sid Meier's Civilization IV. Tin also won the Grammy for Best Classical Crossover Album for his debut album, Calling All Dawns, which also features the song "Baba Yetu". He was awarded a Fulbright Scholarship, becoming the first to be awarded one for film scoring, to study composition and conducting at the Royal College of Music in London, and he graduated with a MMus with Distinction. He was also the winner of the Horovitz composition prize, and graduated with the highest grades in his class. He was also commissioned by the US Embassy in London to compose music for a string quartet. In 2003, he became a Sundance Institute Film Music Lab Fellow. Darrell Scott (2005 USA Songwriting Competition First Prize Winner, Country) was nominated for a Grammy Award of Best Country Instrumental Performance of his song "Willow Creek" at the latest 53rd Grammy awards. Past USA Songwriting Competition winners that have gone on to win Grammy awards include: Cathy Fink & Marcy Marxler who won first prize in the Children's catgeory of the USA Songwriting 2004 and won a Grammy in 2005. Current top winner of the USA Songwriting Competition, Alannah Myles won a Grammy Award for Best Female Rock Performance in 1991. Dave Merenda (Honorable Mention Winner, 15th USA Songwriting Competition) won a grammy award as a co-writer with Sarah McLaughlin with their song "I will Remember You". Dave will be performing live at USA Songwriting Competition's songwriters showcase during the SXSW (South By South West) on Friday 18, 2011 at Borders Books & Music (4477 S. Lamar, Austin, TX). USA Songwriting Competition has a long history of having winners getting success, recording and publishing contracts, have their songs placed on the charts as well as having their songs placed on film and television. 2009 First Prize winner (country) was signed to Universal Records. 2005 First Prize winner (Pop) Kate Voegele was signed to Interscope Records the year after she won and had her winning song hit top 40 on the Billboard Charts, her latest album hit Top 10 on the Billboard 200 Album charts this summer. 2007 Overall Grand Prize Winner Ari Gold had his winning song “Where The Music Takes You” hit #10 on the Billboard Dance Charts. Judges include A&R managers from record labels such as Warner, Capitol Records, Universal, BMG/SONY Music.